Sometimes referred to as a Data Wall or Media Wall, Video Walls continue to gain popularity with businesses needing to display full-screen information in real-time, or within an interactive context. Today’s more advanced Video Walls have narrow bezels in order to minimize the gap between active display areas, providing a more complete and seamless image. Such screens often contain the hardware necessary to stack similar screens together, along with connections to daisy chain power, video, and command signals between screens. Video Walls are used in many different ways: broadcast, data monitoring, surveillance and security, corporate branding, social media monitoring, and more. 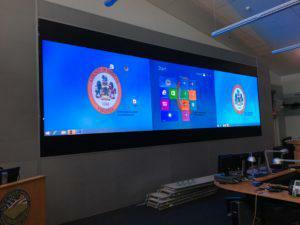 Reasons for using a video wall instead of a single large screen can include the ability to customize tile layouts, greater screen area, and greater pixel density. To learn how a Video Wall can improve communication and information-sharing within your environment, call the Video Wall experts at Trinity Video Communications. From network operations centers to corporate applications and even portable Video Wall solutions, Trinity can recommend and install a Video Wall to fit most any scenario.